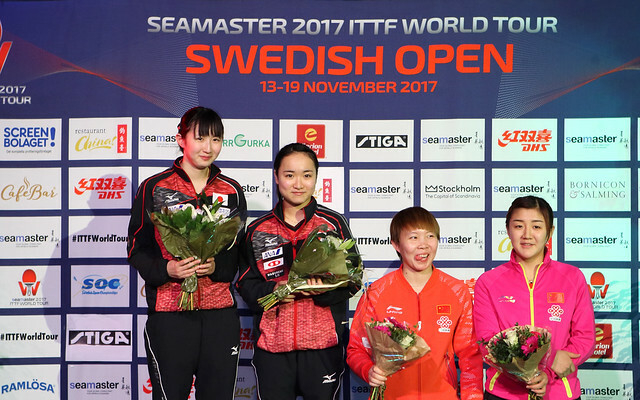 Four days of dramatic action have passed in Stockholm and just as expected the final day of play provided a thrilling conclusion to proceedings at the Seamaster 2017 ITTF World Tour Swedish Open as four trophy matches were contested on Sunday 19th November. Who leaves Stockholm with silverware? Find out in our day four review. Surely the standout fixture of the day came in the Women’s Singles final as Ding Ning and Chen Xingtong fought out a seven games thriller in the race for the title. Unsurprisingly it was Ding Ning who entered the final as the favourite to prevail, occupying first position in the seeding list and eager to add the Swedish Open trophy to her hast collection of silverware. However, much to the surprise of the spectators at the Eriksdalshallen venue it was qualifier Chen Xingtong who came out on top, attacking the ball with the greater confidence of the two finalists and leaves Stockholm as the worthy champion (11-9, 15-13, 10-12, 11-6, 6-11, 6-11, 11-9). China also secured the top two steps of the Men’s Singles podium in Stockholm with Fan Zhendong and Xu Xin meeting face-to-face in the final. Champion at the event held two years ago Fan Zhendong made a strong start to this year’s title contest but Xu Xin displayed an air of calm throughout the tie and four consecutive game wins later (6-11, 11-7, 11-9, 11-6, 11-2) the gold medal belonged to the second seed. Earlier in the day there were two doubles finals to be decided with Japan and China produced the title winning partnerships. Hina Hayata and Mima Ito were in impressive form yet again in the Women’s Doubles tournament as the two 17-year-old Japanese stars came away from the title match with a shock victory against Chen Meng and Zhu Yuling (11-8, 1-11, 11-9, 11-9). While the Women’s Doubles final may not have gone according to plan for China the country did enjoy a successful conclusion to the Men’s Doubles draw after the pairing of Fan Zhendong and Xu Xin recovered from a game down to defeat Hong Kong’s Ho Kwan Kit and Wong Chun Ting (6-11, 11-5, 11-6, 11-8) to lift the trophy.